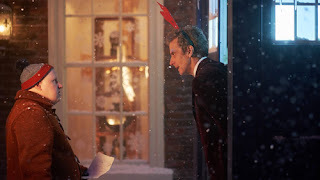 The worst Doctor Who Christmas specials are the ones that are impenetrable to casual audiences, because there's nothing worse than sitting around with your extended family on Christmas Day—expecting a fun, heartwarming fantasy adventure—only for everything to be tangled in so much backstory that it loses the non-Whovians in the room. Most people know the gist of what Who's about, of course, but I still think these specials are an important way to recruit new fans, and too many of the show's recent Yuletide adventures have been alienating messes with added fake snow. "The Husbands of River Song" sits firmly in the good pile (below 2012's "The Snowmen", way above 2013's "The Time of The Doctor"), although it walks a fine line because not everyone's going to be au fait with who River Song (Alex Kingston) is, and why she's so important and beloved of The Doctor (Peter Capaldi). For that reason, I still think this special's aimed more at existing fans than curious aunts and uncles scoffing mince pies on the sofa, but it's not impenetrable. I'm sure a handy eight-year-old will get a confused grandma up to speed. 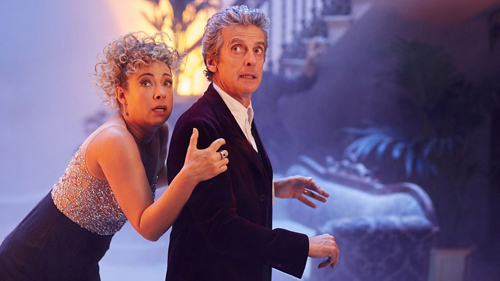 The selling point of this hour is seeing the Twelfth Doctor meet time-traveller River Song for the "first time", and there's a clever twist with the idea River's oblivious to the fact she's interacting with the Doctor, and instead thinks this grey-haired stranger is a surgeon who can remove a priceless diamond from the brain of her cyborg husband, King Hydroflax (Greg Davies)—a despot she's married purely so she can remove the aforementioned gem to sell it. The Doctor tries to drop hints that he's the Time Lord she's looking for in her spare time, but River's blind to the obvious because—as the established mythos says—Time Lords only get twelve regenerations, so she's only interested in finding a particular dozen men. I was concerned this episode was going to be a mess early on, because a warning sign tends to be comedians being given thankless roles—Little Britain's Matt Lucas appears for no particular reason—and early scenes aboard a flying saucer felt like the story was going to be another of those well-meaning but stupid narratives. Just an excuse for quips, leaning heavily on fan-pleasing scenes of seeing Capaldi and Kingston together for the first time—which is somewhat limited in its delightfulness, as River's mostly unaware who she's travelling with. Thankfully, the episode starts to hit its stride halfway through—around the time The Doctor has that wonderful moment when he gets to pretend he's "a companion" and gawp in wonder at how his own TARDIS River's stolen is bigger on the inside. From there, it becomes increasingly amusing to see the River/Doctor pairing bounce through the story together—first, to a space cruiser touring the Andromeda galaxy, to sell Hydroflax's 'head in a bag', which has shades of the "Voyage of the Damned" Christmas special. And, later, when the penny drops that River's accomplice is actually The Doctor she's been looking for, it's a lovely moment and I was pleased to find that Capaldi/Kingston are easily the best pairing for these two characters—perhaps because they're of a similar age? There's none of the weirdness of Series 6 when River fancied Matt Smith's very boyish and whimsical Doctor, thankfully, so now they're more like an old married couple whose love's matured beyond physical attraction. It's like seeing cool parents hanging out, reliving their lost youth, getting into scrapes they should know better to avoid. The Doctor even laughs for what seems like the first time in years, simply happy to be in River's presence—a woman who treats him as he treats his earthly companions, always keeping him on his toes. 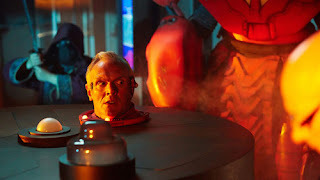 The storyline's a little thin and you're instantly going to forget a third of what happened, but in the moment "The Husbands of River Song" is a dazzling flash of fun and laughter. The Christmassy street the TARDIS landed in was the exact same set used for the trap street in "Face the Raven", right? I may be wrong, but it looked exactly the same. If it was the same set, they could have disguised it better. If it wasn't, why mirror trap street so much? 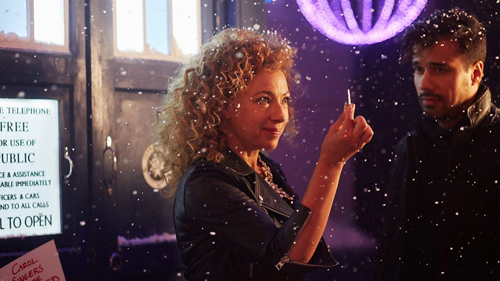 So, River is 200-years-old now because her life span's been augmented. This obviously means she can return plenty more times in the show's future. Nice to see her famous TARDIS diary again, too. I liked the idea she's getting anxious about her own destiny, seeing as the diary's about to run out of pages and it's entirely possible The Doctor gave it to her knowing how thick it would need to be. Considering the brouhaha caused by some scenes in ITV's Jekyll & Hyde when it began, I was a little surprised by how graphic that sequence was of a man basically unzipping his own head like it was a purse. A fantastic visual, wisely shot from behind while The Doctor took the edge off the horror with a funny remark, but still… too much for little 'uns watching? 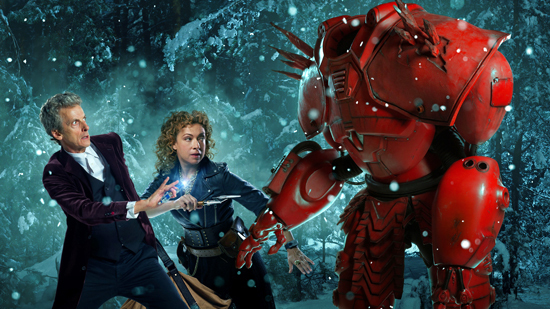 The new sonic screwdriver was used, but it seems the sonic glasses are still around as an alternative. It certainly makes more sense for The Doctor to pop on specs to analyse visual things, rather than wave a screwdriver at it and read a display. River has a sonic trowel, because she's an archaeologist. The Doctor thinks it's embarrassing, so gets her a proper screwdriver on their date. Anyone else think Hydroflax's enormous robot body was a combination of Games Workshop Space Marines and the red-armoured Baymax from Big Hero 6? I'm Dan Owen (freelance writer, film buff, TV "obsessive") and this is DAN'S MEDIA DIGEST; a corner of the web where I've been reviewing TV/film and writing about Anglo-American media since 2006. Feel free to get in touch about writing-related opportunities. (c) 2006-2015 Dan Owen. All rights reserved. No content appearing on this site may be reproduced, reposted, or reused without written permission.